Julie Sweet, pianist and accompanist at Gustavus Adolphus College, and Joseph Kapla, a collaborative pianist and instructor in the Twin Cities, join forces Sunday, October 3 for a Duo Piano Recital on the Jussi Björling stage at Gustavus. The performance includes The Hallejuah Junction by John Adams, the Sonata in F minor for 2 Pianos by Johnnes Brahms and Le carnaval des animeaux par Camille Saint-Saëns. The recital begins at 3:30 p.m. and is free and open to the public. The Department of Theatre and Dance at Gustavus Adolphus College is pleased to present Time to Soar: The Gustavus Dance Company in Concert. This dance concert, directed by Michele Rusinko and Melissa Rolnick, features an exhilarating and diverse range of faculty, student and guest choreographed pieces. Performances will be held in Anderson Theatre May 14 and 15 at 8:00 p.m. and May 16 at 2:00 p.m. 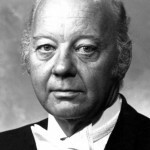 Longtime Gustavus Adolphus College concert choir director and Professor Emeritus of Music Philip F. Knautz ’48—known to a generation of Gustavus student singers as “Mr. K”—died April 26 in Colby, Wis. He was 86. If You Like Flutes and Woodwinds…..
Sunday, May 2, is a special day for the Department of Music at Gustavus Adolphus College and for anyone who likes woodwinds, especially flutes. The department has four concerts scheduled throughout the day. All will be presented in Bjorling Recital Hall and all are free and open to the public. The St. Ansgar's Mens Chorus and the Gustavus Chambers Singers, both under the direction of Rod Urtel, combine talents for a joint spring concert on Friday, April 30, beginning at 7:30 p.m. in Jussi Björling Recital Hall. This performance is free and open to the public. In addition to Michael Johnson's annual concert at Gustavus this Friday, December 11, guitar, brass and choral recitals and concerts fill Jussi Björling Recital Hall the final weekend of the 2009 fall semester. Michael Johnson, the singer, song-writer, storyteller, and guitarist who has delighted audiences at Gustavus Adolphus College annually for forty years, returns to Björling Recital Hall, Friday, December 11, at 8:00 p.m. This performance on the Gustavus campus is the only performance the national recording artist will present in southern Minnesota this season. The Gustavus Jazz Lab Band and the Adolphus Jazz Ensemble, directed by Steve Wright, present their combined fall concert Saturday, November 21 at 7:30 p.m. Saturday's performance by the two jazz ensembles will be presented in Jussi Björling Recital Hall. It is free and open to the public.